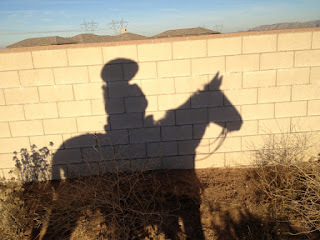 It was delightful to get a start on the New Year with a ride into the desert. 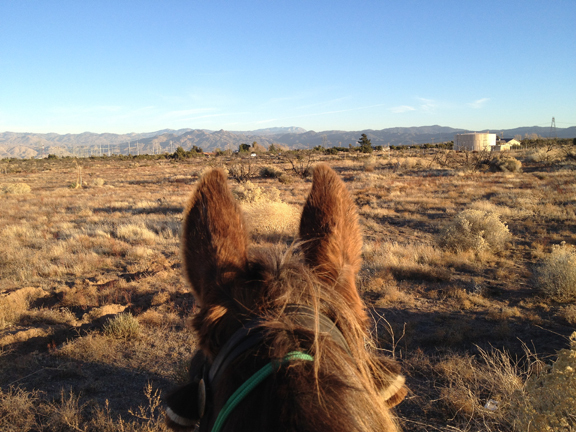 Tobe and I did a lesson with Jerry Tindell in the arena, and then went for a walk, just the two of us, in the slanting afternoon light to enjoy being together. I'm working on focusing on less hands and more leg, and Tobe is glad I'm doing that! The more I can tell him clearly what to do, the better mule he can be. Onward into a New Year with more skill and more adventures! Difficulty: Not! 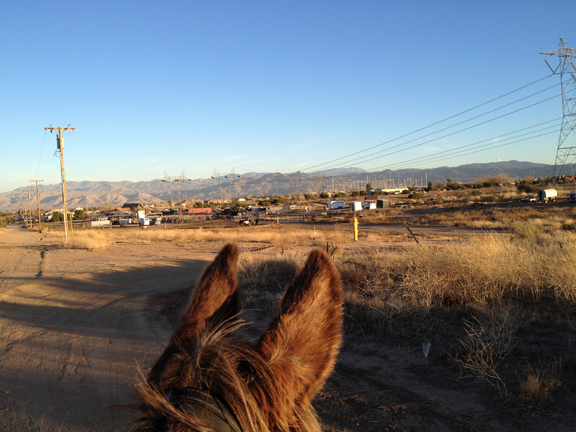 Walking on the Edison access dirt road, trails through the desert, or roads cut for the housing developments that have only partially materialized. 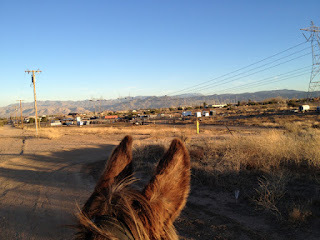 The presence of off-road minibike riders was unnerving, roaring down the desert trails, but they never came too close. 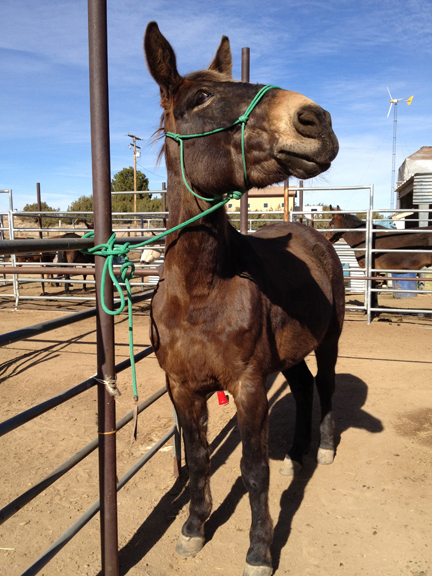 Tobe waits patiently to see what I might be suggesting we do. I tell him first we are going to do a lesson, and he thinks he is going to show ME a thing or two he's learned in the week since I was last here. He is a star pupil at Mule School. We worked on side-passing, and lateral flexion, and the less I use my hands and the more I use my legs the better we can do it all. I am humbled, he is a very good mule and I am becoming a mule rider. As I improve, he always keeps up. 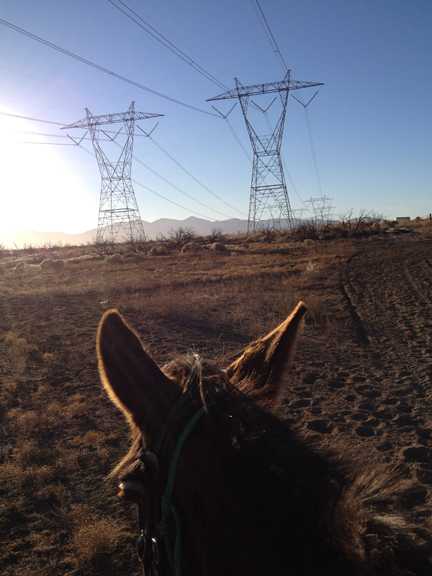 After the arena work I wanted to take him and just go for a walk in the desert, so we headed off to the land of the Steel Kachinas. The power lines have an access road cut underneath them that heads back toward the highway, the old route 66, so I thought we'd just go explore that a bit. I'm always amused that I'd never want to just go walk over there and take a look alone, but add in the companion aspect of walking my Irish Wolfhounds or riding Tobe and instantly random places seem worth investigating. 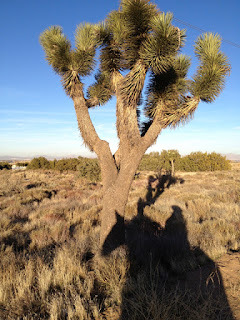 Joshua Trees dot the landscape, and our shadow looked like a Knight and Medieval war horse in flowing jousting drapery. More realistic is this shadow against an estate wall, Tobe is fixing on the sounds of the minibikes ahead. Fortunately they are so extremely loud that we would have plenty of time to exit a trail if they were barreling towards us. 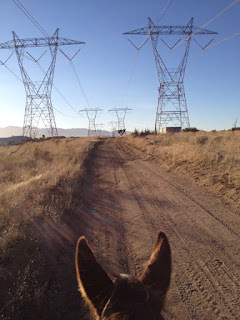 We continued down trails and then AT THIS POINT HE STARTED TO SNORT and refused to go ahead, and upon inspection I could see crows massing on something in the desert................ it was time to let Tobe be the decider. Whatever that dead thing was he didn't want to investigate, and I agreed. It took a bit of a discussion to make it clear we were not going to run away from that smell, a learning moment while we turned and walked away calmly. 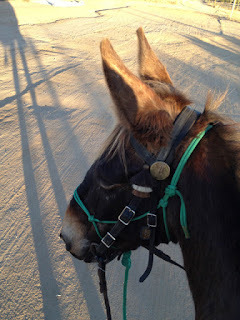 I will always praise a mule's sense of self-preservation, but I don't want to have to hang on if he wants to bolt. We negotiate. 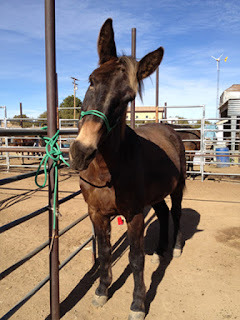 And that's an overview of the Jerry Tindell Mule and Horse School, where Tobe is getting gold stars and attitude adjustments and skills and thrills. While I work on relocating my business and getting up and running in the new location for the New Year Tobe will continue to stay at the school for a few more weeks, getting ready for the adventures and Lucky Trails we will have in this Good New Year.